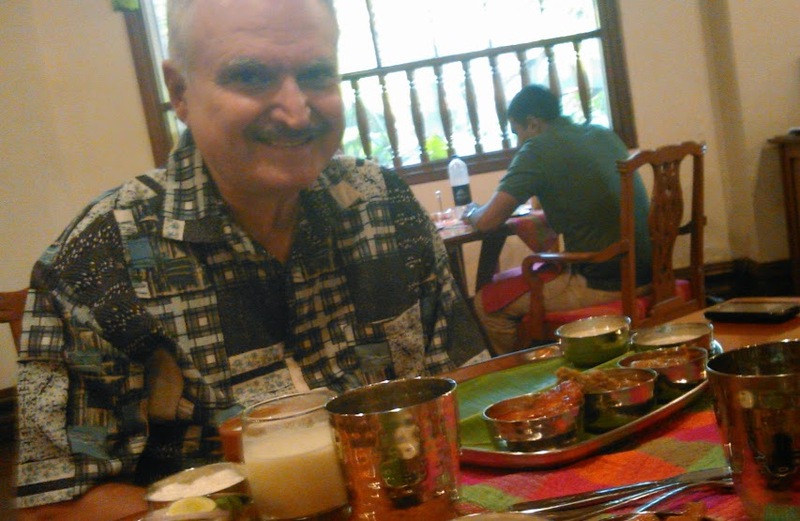 The South of Vindhyas is the famous restaurant that serves up south Indian cuisine from the States of Kerela, Tamil Nadu, Karnataka and Andra Pradesh.And whom better to take along but the Foodie Mr Aspi Irani. You can also avail of the A La Carte Menu at the restaurant. 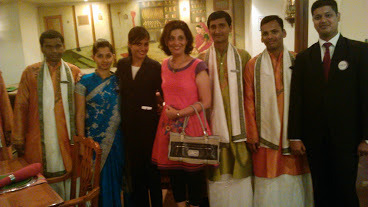 Pleasantly greeted by the restaurant Manager and a big smile by the other staff, we were guided to out table. The huge lit Diya and spice boat at the entrance prepared me for the Gastronomical and cultural feel I was going to experience that day. The interiors were bright and colourful, the lighting and music was perfect to go with the ambiance. I noticed the pretty windows and thatched roofs to go with the Southern restaurant theme. 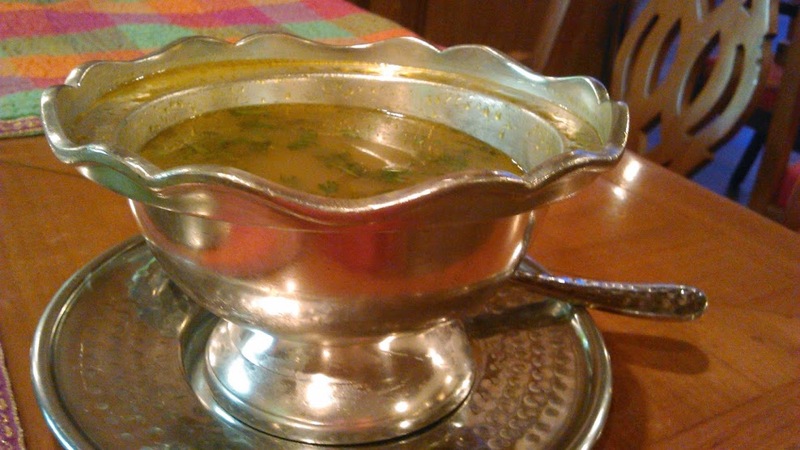 At first we were served up hot chicken Broth in a majestic bowl fit for a Kings dinner table. It was peppery and worked like magic for my runny nose. 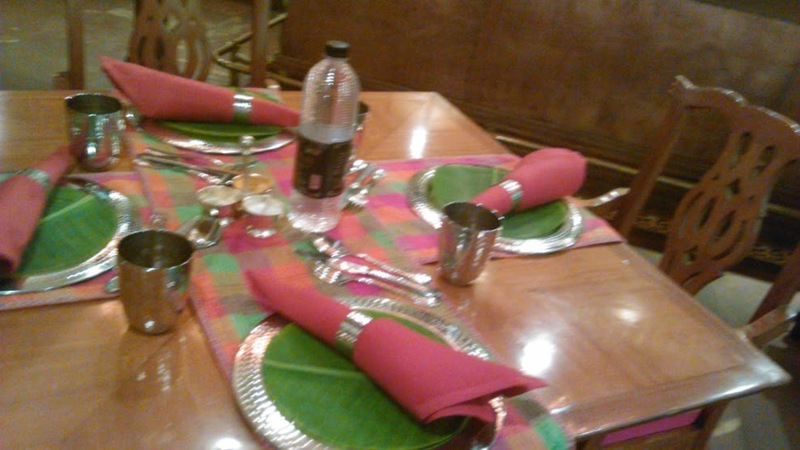 For starters they served us the Spiced Pepper chicken, It was outstanding and very tender and served in a well polished silverware dish lined with a Banana leaf.The dishes were promptly cleared and ” Behold ” It was thali time now. The elaborate Sit down meal. 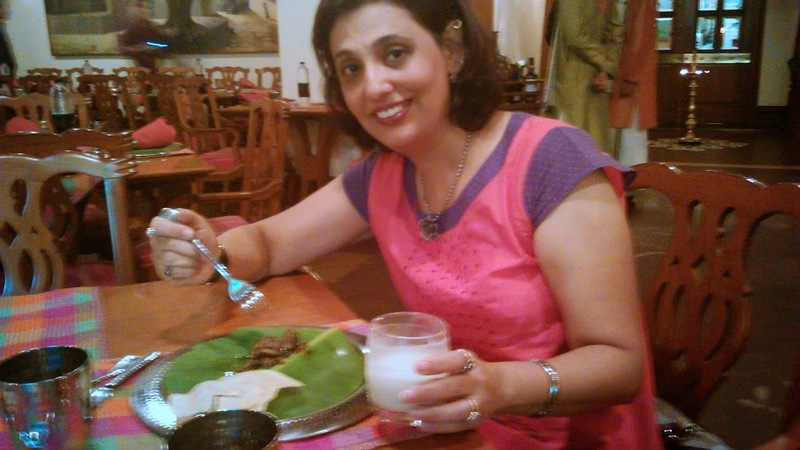 I sipped on my buttermilk before I tucked in my royal non veg thali. 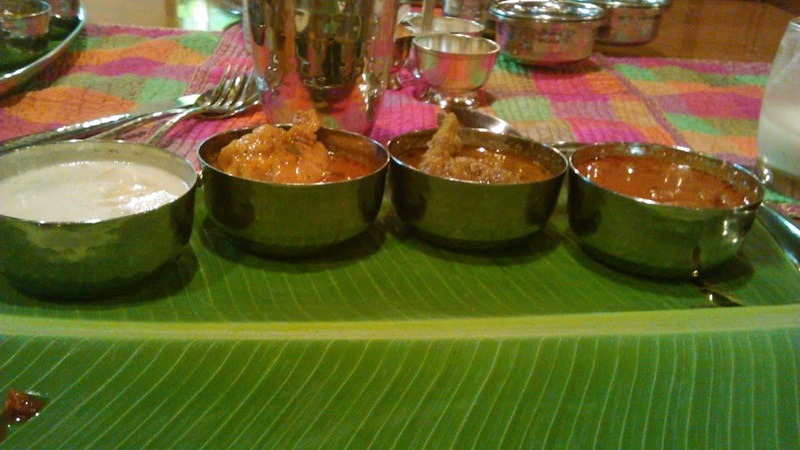 It had a chicken , meat and a fish preparation with a whole load of other south Indian dishes includind Payasam , curd , curd rice , and mixed stew. 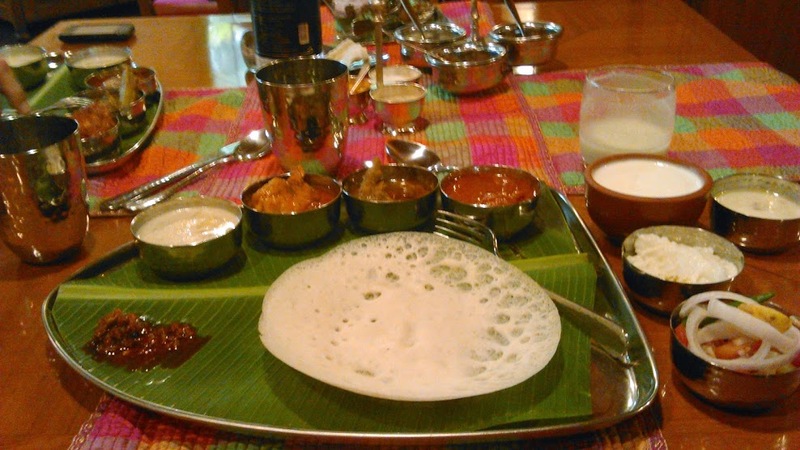 Freshly prepared appams were served up while we ate with our hands and licked our fingers. 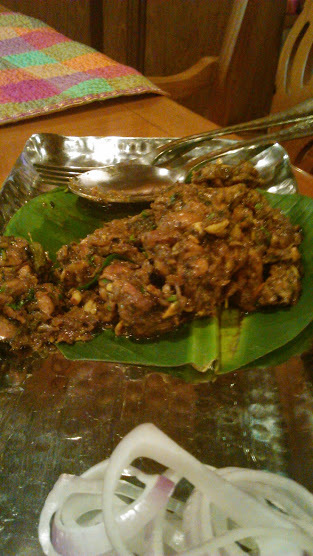 A special mention here to the ” Podi Mamsum” – succulent mutton spiced with Nellore spices, that was my favourite dish on the thali. Masala rice, plain rice and an assortment of Dals followed. Later when I was asked if I liked to have a choice of extra dessert I simply could not resist the Ras Malai I had been craving for quite a while. It was huge, creamy and I did not feel guilty about having it all by myself. 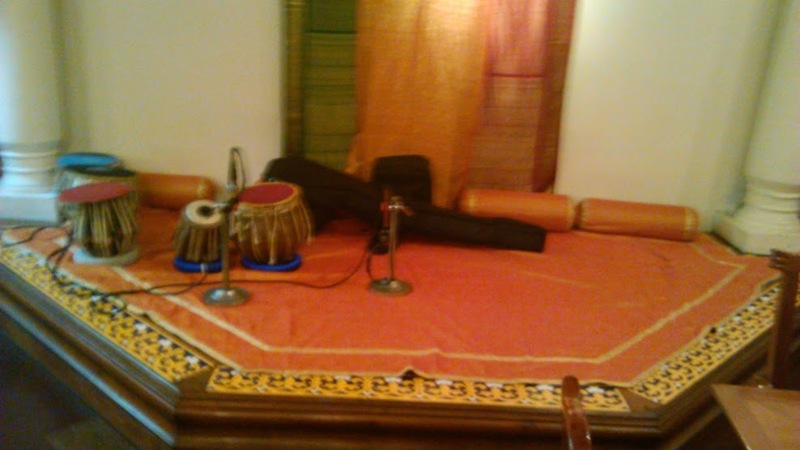 At night this place offers light Live karnatak music by musicians. Quite a sumptuous dinner this one, and I would long to go back and try the seafood Thali that promises squid, prawns and more variety of gravy’s and fries. Very true..South India is so beautiful and talking about the dishes, they makes my mouth watering, Love to go Again in South..! !